I always hear that baking is a science. That with cooking you can throw in what you want and you’ll be fine. But baking, BAKING takes a certain degree of skill. Or in my case, luck. 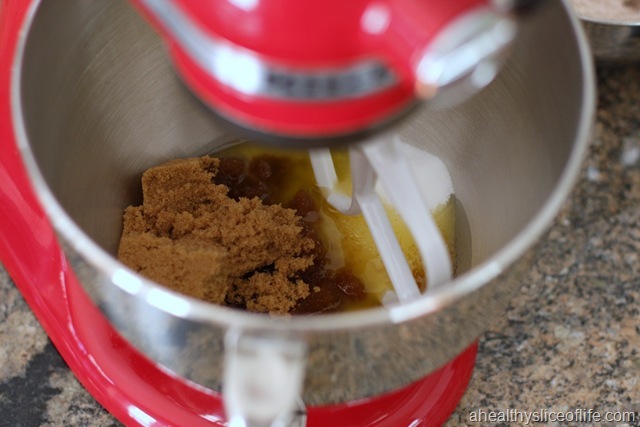 The cookie gods were smiling down on me the other day because there is no other explanation as to why I would attempt making up an original recipe for cookies. But I’m so, so glad I did. I was going to post this recipe next week, but with the weekend ahead, I wanted to give you time to make these. Because you must. I can’t keep my hands out of the cookie jar with these around! Preheat your oven to 320 degrees. 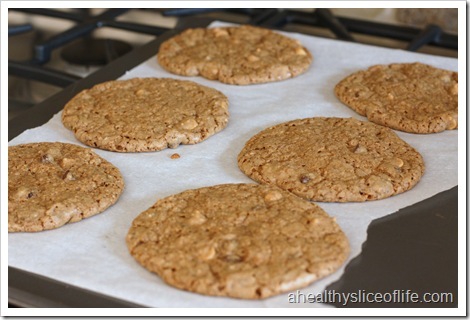 This recipe makes 16 large cookies. 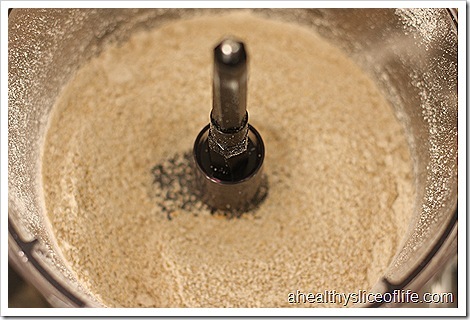 The first step is to create your flax eggs. 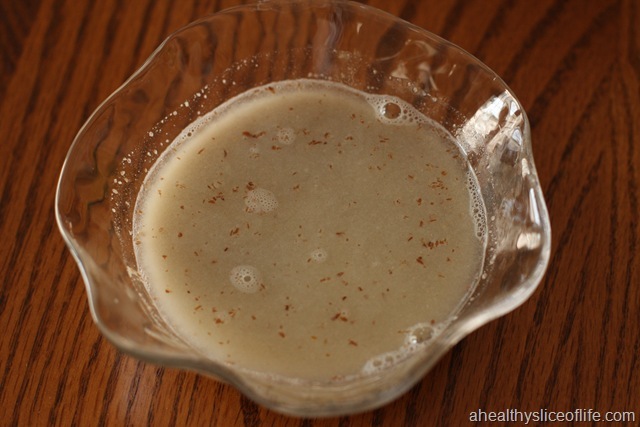 You can substitute 1 Tbsp of flaxseed meal + 3 Tbsp of water for 1 egg in any recipe. 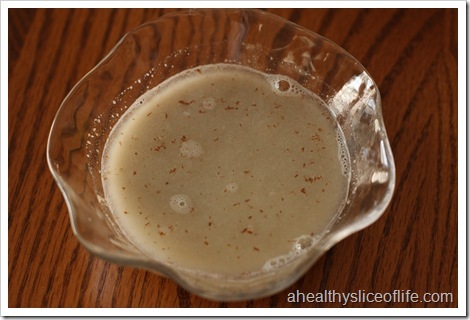 In this recipe, make 2 flax eggs. 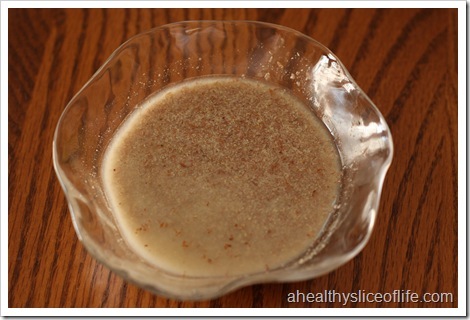 Simply mix together the water and flax and set aside for 5-10 minutes to allow it to gel. 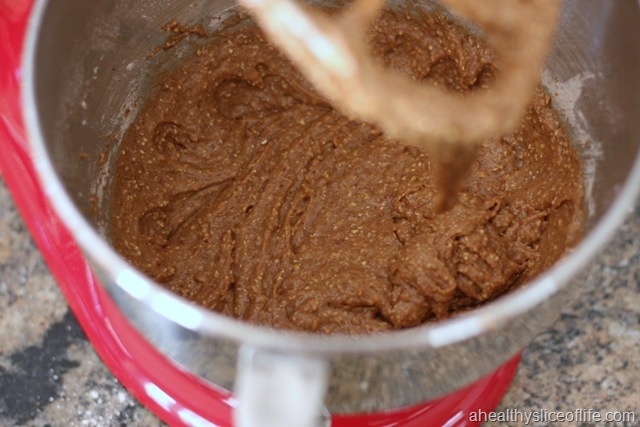 While your flax eggs are gelling (are you gellin’? 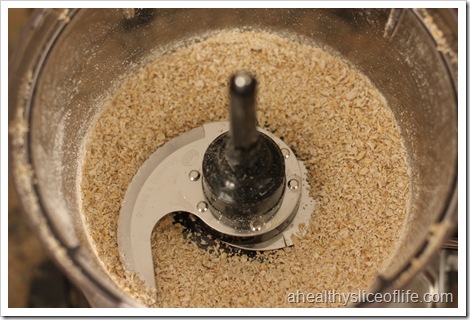 ;)) turn your oats into oat flour, which is easy. 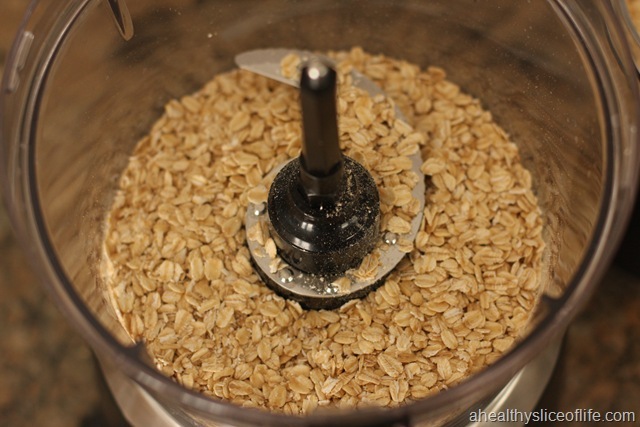 1 cup of oats into the food processor. Grind for a minute or so. Check it. Grind another minute or so, until the consistency of flour. 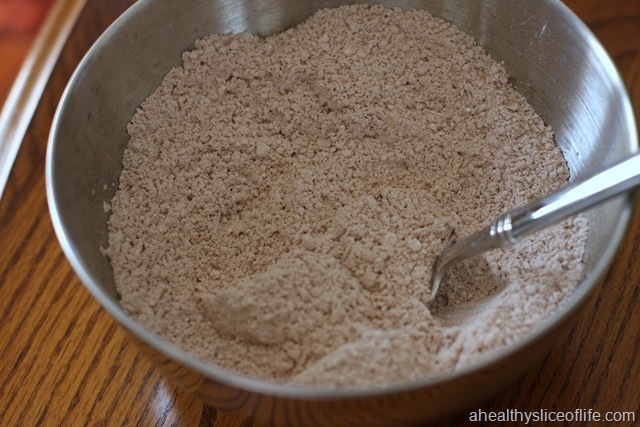 In a separate bowl, mix your oat flour, regular flour, cocoa powder, salt and baking soda. 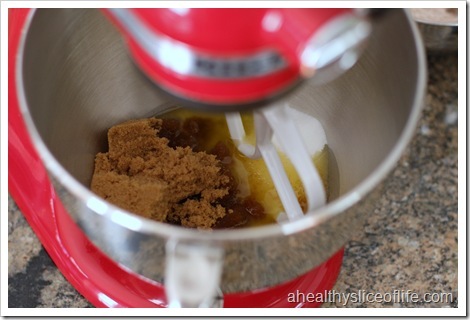 In a mixer, throw in sugar, brown sugar and melted butter. 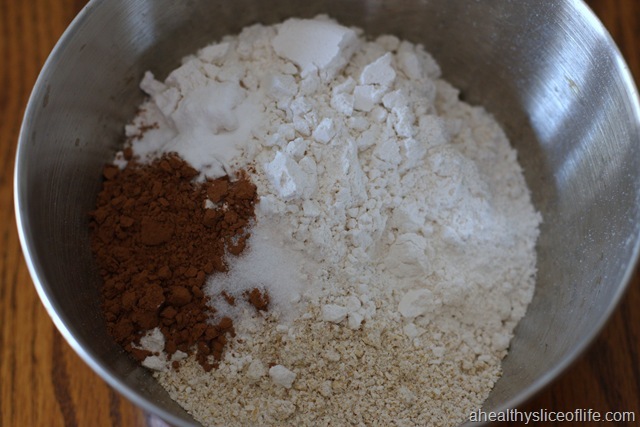 Mix well, then add in your flax eggs. 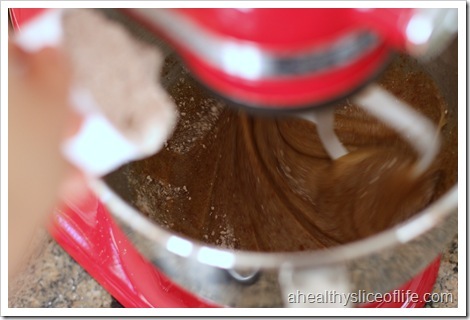 Mix about a minute, until well combined, then slowly add in your flour mixture. 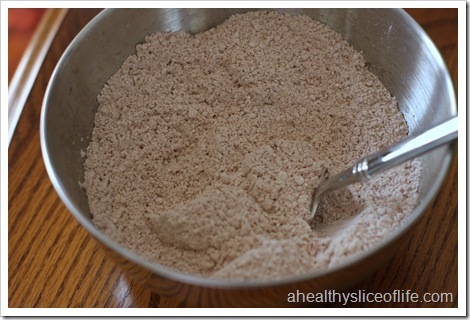 Once all your flour mixture is added, mix for another minute or two. 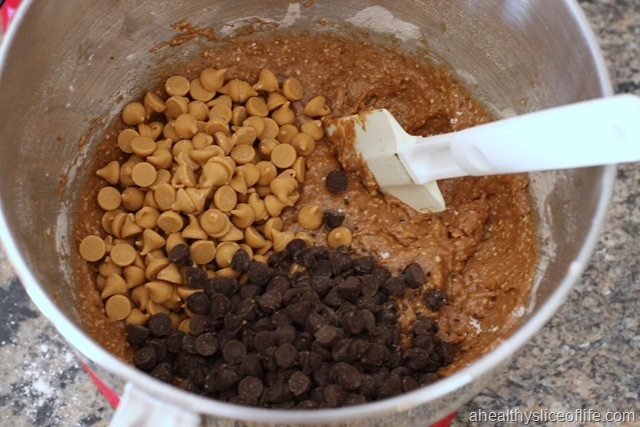 By hand, stir in your chocolate and peanut butter chips. 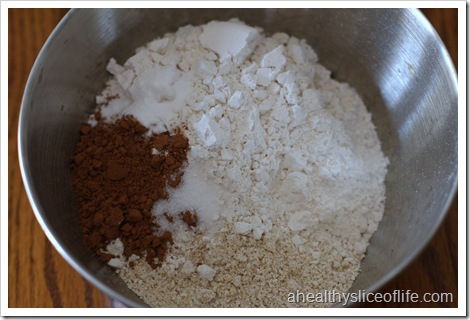 Use a 1/4 measuring cup to scoop dough onto a greased cookie sheet, or parchment paper. But the real question… are they Hubbs approved? Got ‘em! Hook, line & sinker! Delicious! The only problem with these cookies? We can’t stop eating them. I’ve tried breaking off half, only to come running back into the kitchen minutes later to retrieve the missing piece. As Maria told me on Twitter, Cookies aren’t meant to be broken in half. PS- looking for a entree to eat before these cookies? Make it a fab Friday night and start off with Homemade Pizza! 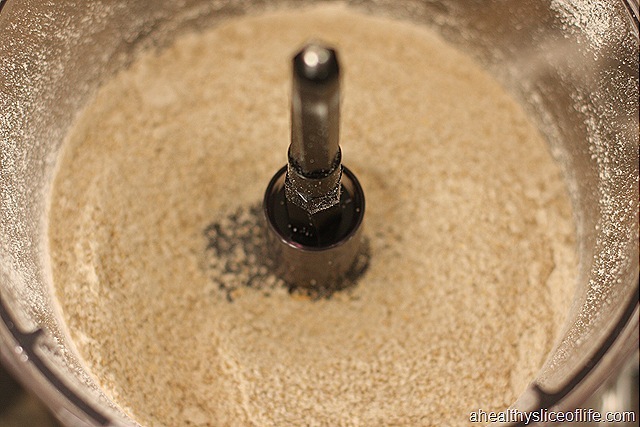 Can you add some Brewer’s Yeast and turn them into a yummy lactation cookie for me??? 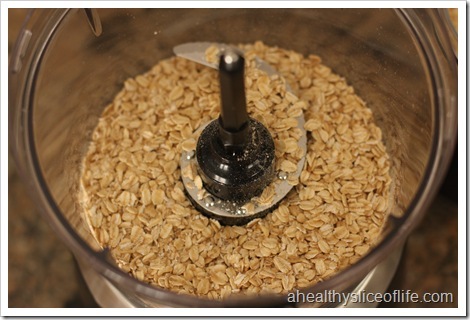 You already have the oats and flax seed! 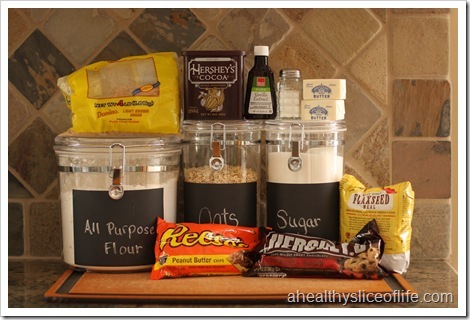 Can’t tell which I’m more impressed by: the recipe invention or the incredibly organized labeling of your baking supplies. 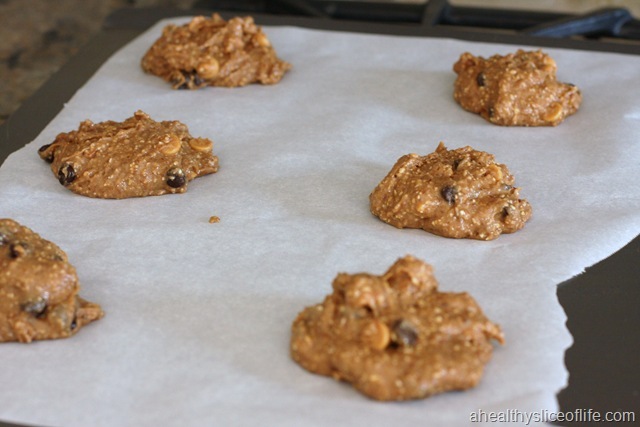 yummmmm…good job creating a cookie recipe! Looks good! Your cookies look delicious. 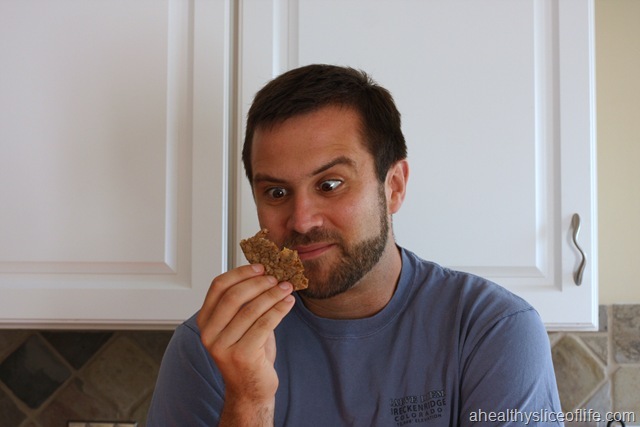 I have the same problem of not being able to stop eating them when I make cookies…but I love that your recipe doesn’t contain eggs! I’ve made a couple of baked goods recipes lately and was a little sad that I couldn’t try the batter. Oh my gosh. You had me at “peanut butter chips”. hahaha those look SO good!!! I’m always amazed at people that can just whip up something without a recipe. I could *never* do that.. I can barely get recipes I’ve followed exactly to turn out right! haha. Great job with the recipe! I love your husbands facial expression…he’s a good sport! Your hubby’s face is priceless. How hilarious! I love those PB chips so much! 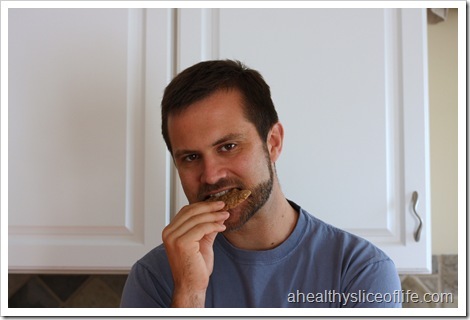 They look yummy – I love when cookies are that big! I’m perplexed by the “flax eggs” – I’ve never seen this before but what a great sub if I’m out of eggs! 1. 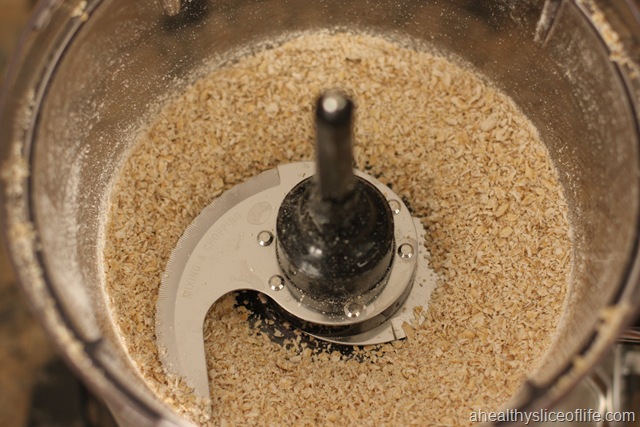 I need a food processor or at least a store that carries oat flour. 2. 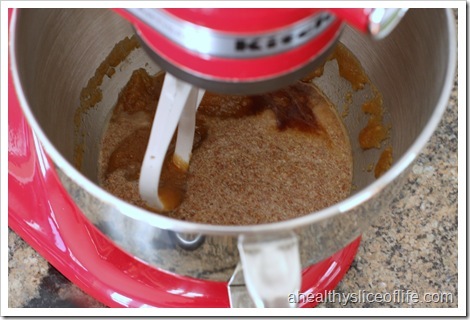 I need a Kitchen Aid Stand mixer. 3. I need some flax. must make! 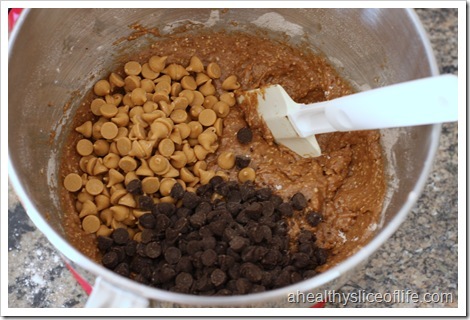 i have a serious weakness for any combination of peanut butter and chocolate…especially in cookie form! 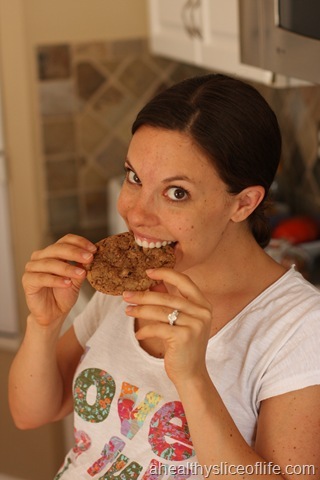 And I certainly agree with Maria- EAT COOKIES WHOLE!!! Haha! Those pics of your husband made me laugh out loud 🙂 how great! Wow!!!! 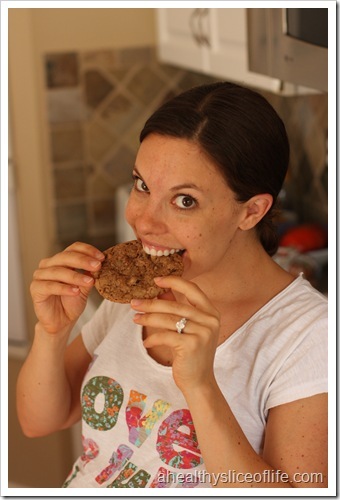 You are a cookie maven! They look fantastic, and love the pictures of your husband! 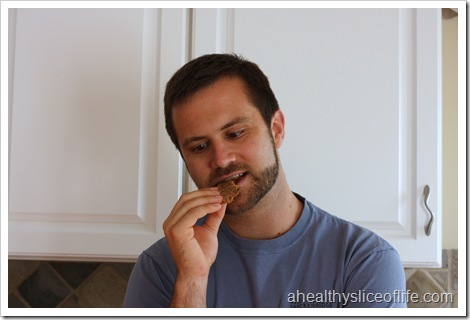 And Maria is right, cookies are NOT meant to be cut in half!! 🙂 Have a great day. 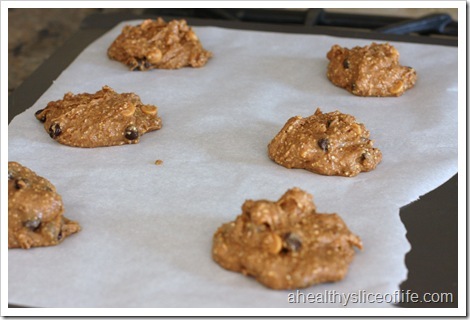 Okay i totally made my own recipe for oatmeal raisin cookies earlier this week but now i have to make these asap! Oh my goodness! 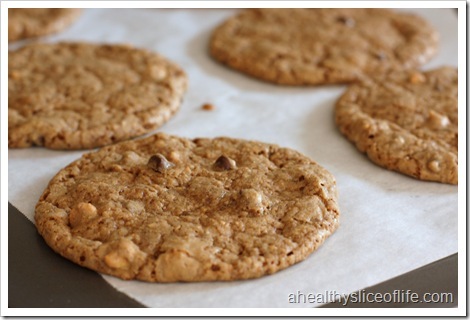 I’m baking these this weekend! My mouth is watering! 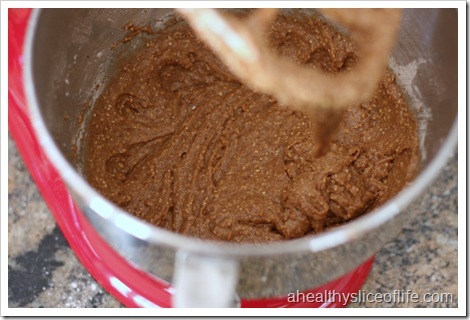 Love this recipe because its 100% ok to lick the bowl clean – YUM! As you can see, they are still very much a treat, just with some redeeming health benefits. They are big cookies, though, and I noticed that I actually stayed full after eating one. They have a little staying power in them! 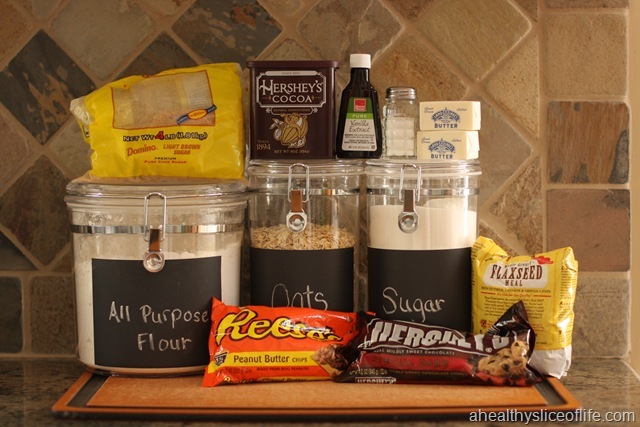 OMG those cookies look perfect. I can never get my cookie creations to look that good. Nice work. I’ll let you know if I try them!! i think i will make these to bring into work! 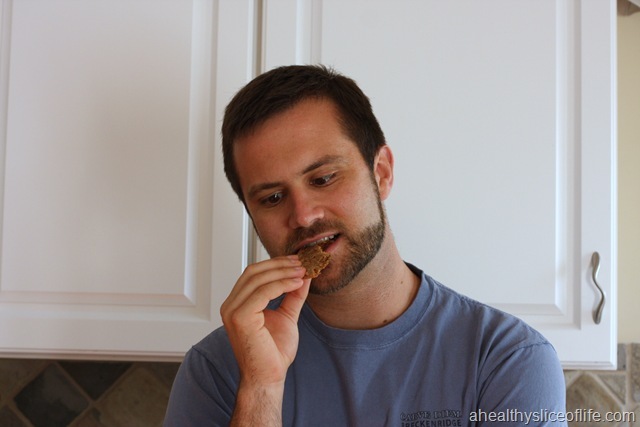 i love healthy cookies! Hi Brittany, can you let me know why do you add cocoa powder and vanilla extract? Please suggest substitutions if possible. 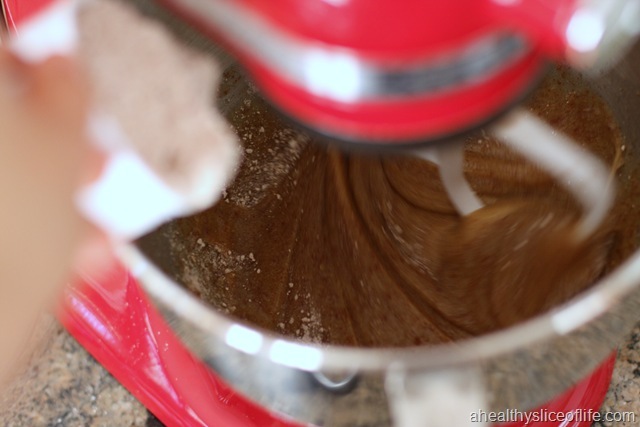 Instead of brown sugar can I use maple syrup and instead of peanut butter chips can I use peanut or Almond butter? Thanks! I love reading your blog! Honestly I am a novice baker and just lucked out that this combo worked! 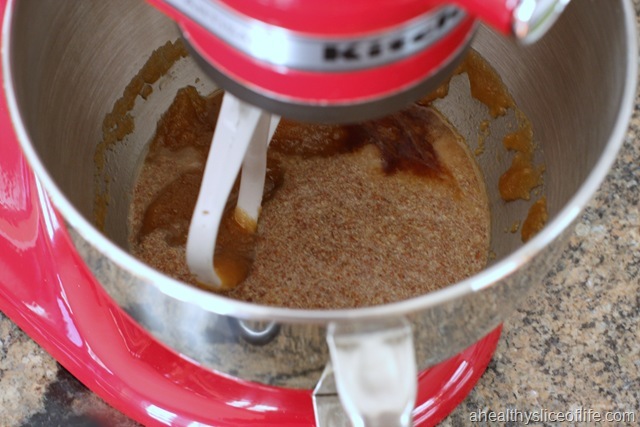 Maple syrup will change the consistency, so I can’t say for sure how they will turn out. If you give it a try, please report back though! 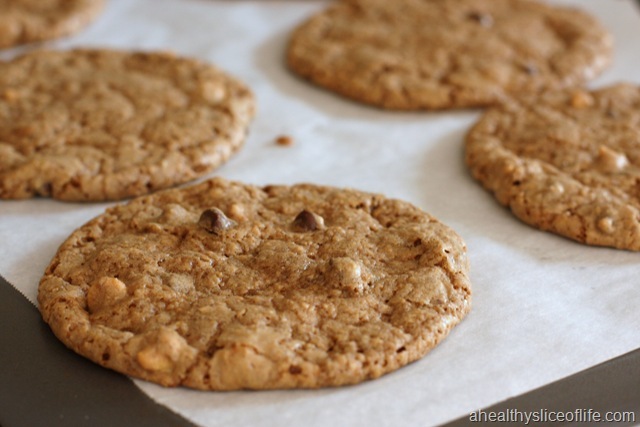 And if you can’t find peanut butter chips, double up on the chocolate chips. Thanks for reading! Thanks Brittany. How do you get such perfect shapes? Hi Brittany, Just wanted to update you. I made this with maple syrup. 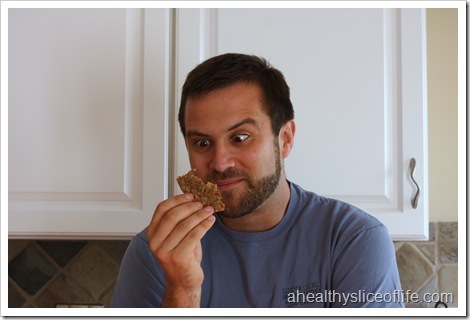 I didn’t like it as much as I do the brown sugar cookie which you warned me about. But my toddler loved it! I really want to know how you achieve that shape ! Thanks.